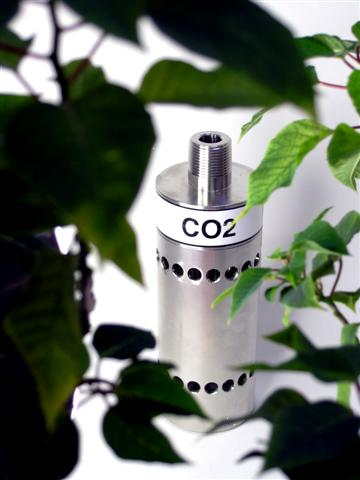 A new CO2 detector engineered to monitor levels of greenhouse gas emissions to meet proposed EPA strictures has been developed by Sensor Electronics of Minneapolis. The new detector can “see” atmospheric CO2 levels from zero to 1 million PPM. The detector and associated controller offer both readout and record capabilities. The system can show – on a monitor or real-time display – actual ongoing CO2 levels; it can also drive computers, printers, plotters to chart CO2 levels to meet compliance requirements. Depending on application needs, the detector can be mounted indoors or out. Outdoors the unit shrugs off rain, snow, sleet, hail, indoors it ignores dust, dirt, aerosols, even corrosive atmospheres. Despite its ruggedness, the detector is extremely sensitive, measuring high or low greenhouse gas concentrations in PPM’s. Readings are accurate to within 03 per cent. Self-checking self-correcting circuitry automatically compensates for voltage drift or component aging. The detector continually compares twin IR signals – one reading CO2, the other a standard reference. Result is superlative accuracy, even at high or low CO2 concentrations.